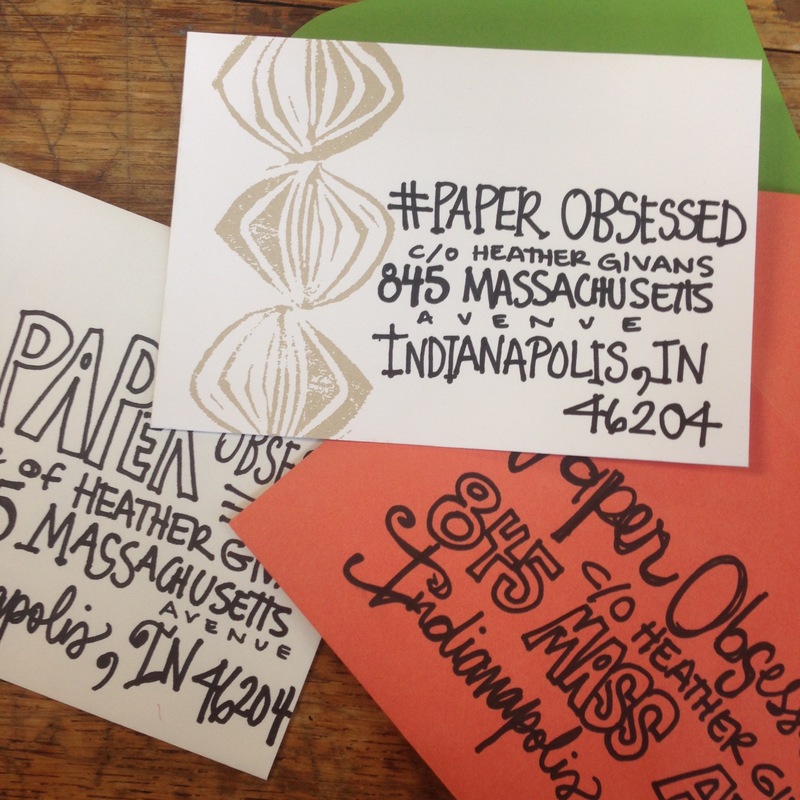 #PaperObsessed – I need mail for Quilt Market! I’m gearing up for the announcement of my new collection of fabric for Windham Fabrics at the Fall International Quilt Market in Houston, TX. I. Need. Your. Help. I have a plan to adorn my booth with fanciful envelopes that are littered in stamps. Will you consider sending me an envelope? You should know that I’m a bit of paper hoarder. I love making envelopes from handmade papers; I love writing mail. I ABSOLUTELY love addressing envelopes. One summer I was paid by my mail carrier to address all of her wedding invitations. She paid me real money and I dreamed of a job where that’s what I’d do all day. Let’s be pen-pals! Ok. So maybe I won’t be able to write a full on letter, but in exchange of you sending me a fancy envelope, I would love to send you a little something in return. And why not make it a give-away?! I mean, that’s fun, right?! Each envelope that is received before October 15, 2015 will be reciprocated with a response envelope (hand written by me) and an instructional sewing pattern that you know will be PAPER themed. I’m trying to woo you, here. All of those envelopes will travel with me to quilt market and appear in my booth! So far so fun, right?! And of all of the envelopes received I will choose three winners who will get a big fat bonus package in the mail – a fat quarter bundle of my new fabric Paper Obsessed. How do you win?! One person will be supremely lucky as one giveaway will be completely random. One person will win by creating my favorite envelope – think high creativity and decoration!! One person will win because they live someplace that sounds amazing, absurd, or unrecognizable. International friends are encouraged to play! I mean, these are just questions I would ask myself so I thought I’d try to get down to the nitty gritty. Hey, Heather Givans, I don’t want my address blasted all over the universe. How can you insure that my private information will be shielded from the paparazzi? I would suggest that you put your return address on the back of the envelope! Along with your return address, I’d also put your Instagram handle if you’d like to be tagged on the Instagram. When these items are at the quilt market, they will be facing address-side-out — so don’t put your best work on the backside. If you are super super super private, you can always put your return address inside the envelope and no one will know it was you! Hey, Heather Givans, do I have to write you a letter? I mean, I don’t really have much to say. You don’t have to write me a letter. I mean, if you want to take it as an opportunity to tell me something, great. But you don’t have to. Truth is, I always beg to address the envelope and sometimes fall short on the correspondence. That’s totally ok. Address that envelope and let’s play! Hey, Heather Givans, can I send you more than one envelope? Can I send you an envelope everyday until the contest ends? YES! You and I were meant to be friends. Send me a letter everyday. It could sway the vote. I can’t be sure but it certainly couldn’t hurt unless you send me smelly cheese inside the envelope or something. 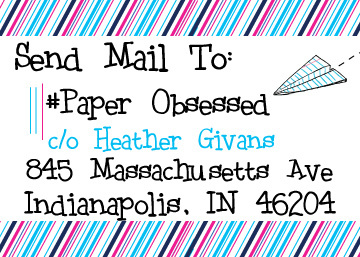 Hey, Heather Givans, I’m just going to send you a post card. Is that ok? Does it REALLY need to be an envelope? Post cards are cheaper, you know. I really do want envelopes, so post cards might be taken to market but they won’t be included in the drawings. Hey, Heather Givans, does this have to be made of fabric? Or do you legit want paper? I mean, the collection is called Paper Obsessed, so you best make it paper for now. Fabric posts will come later. Also, it would be real real cool if you could share this with your friends! It would be a great display with lots of envelopes and stamps!!! Tell a friend! Now is the time for all good people to write letters to their family and friends! OOOH! I used to collect stationery so I have gobs that I wouldn’t mind clearing out. I’ll be send you a few letters. Yesssss!!! This is going to be a fun game! How Fun!! Love this idea. And love to use paper and words and draw things. Hi! I think it arrived yesterday. I’ll confirm when I get to work! Thanks for sending this. The handmade paper is lovely. Agh! I missed the receive by deadline! But if you don’t mind, I’m still going to send you some mail anyway! Hi, Heather, how is it going? You must be pretty busy,….we have not hear about how this project wrapped up. Maybe you are planning a Christmas suprise? I LOVE surprises!